Featuring a pleasing flavor that's not too strong and not too sweet, these roasted espresso coffee beans covered in a layer of swirled marble chocolate provide the perfect ending to any meal. Each DaVinci Gourmet marble chocolate covered espresso bean has a slight crunch and is filled with robust espresso flavor that will energize and refresh guests as they leave your establishment. 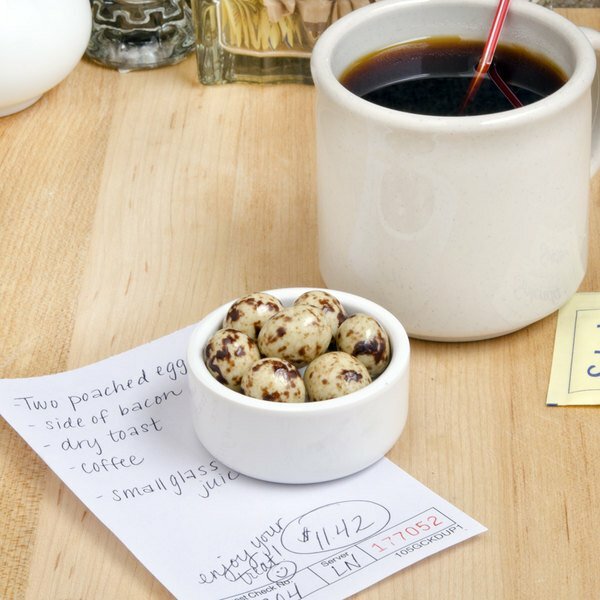 Simply drop these espresso beans off with the check as a way to thank guests for their patronage, and they'll feel a sense of appreciation for your business. 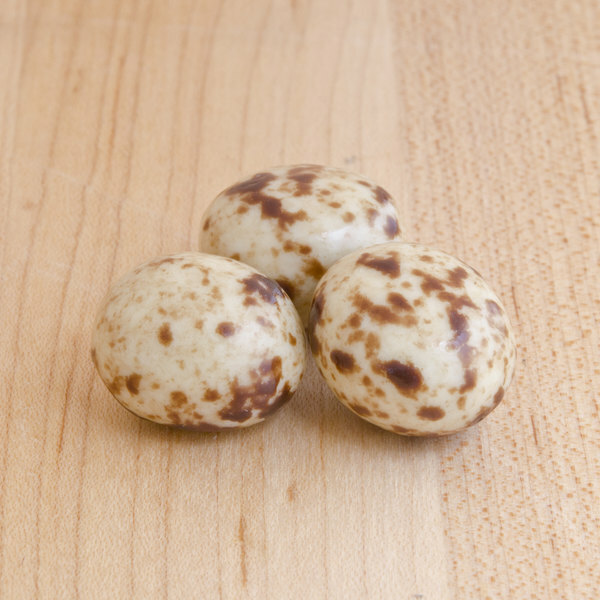 Smothered in a blend of semisweet and white chocolate, these espresso beans contain natural antioxidants. Since they are rich in caffeine, they will provide an extra spring in your guests' step anytime throughout the day. These espresso beans are great to take with your patrons on the go or to enjoy with a cup of coffee at your coffee shop. Increase the likelihood that your customers will visit your establishment again soon, and offer these smooth, irresistible espresso beans! Sold in gourmet coffee shops, specialty food stores, and cafes, DaVinci Gourmet products, like these marble chocolate covered espresso beans, have a long history of commitment to quality and superior taste. ok, do yourself a favor and just buy yourself a few bags because these marble chocolate's are soooo good! I've had their dark chocolate ones but these ones are so much better. These little gems, are a hit! A lightly roasted espresso bean, with a smooth outer shell of marble chocolate. The fresh smell of roasted espresso beans fills the store each time we open a new bag!!!! The marble chocolate covered espresso beans are delicious. They are great for tossing in with nuts for a great tasting trail mix. Love easting them by themselves for energy boosts. A great way to get a little pick me up in the afternoon. The DaVinci marble chocolate covered espresso beans are delicious and very fresh. These Marbled Chocolate Espresso Beans are a customer favorite. (Also my favorite) A Perfect combination of delicious chocolate and a little crunchy coffee kick in the middle! The marble chocolate covered espresso beans are a good mix of sweet chocolate and crunchy espresso beans. We sell them in the 8oz ice cream bowls about 5 oz fit in a bowl. Visually these are beautiful. You can smell how delicious they are before even opening the bag. 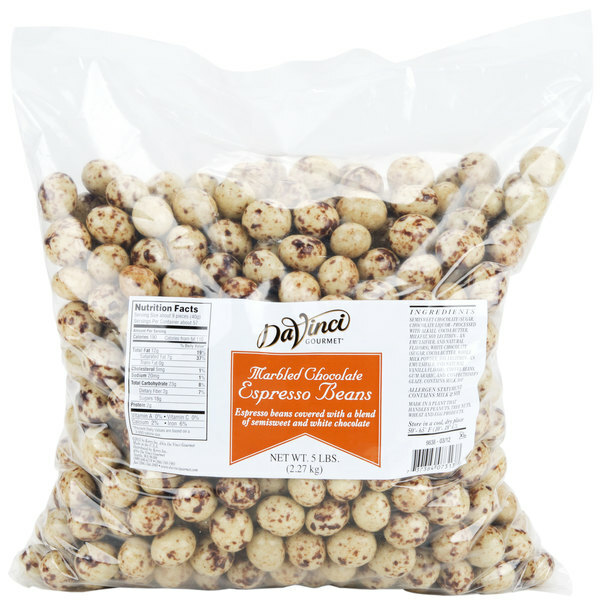 Great price for 5lbs of chocolate covered espresso beans. I love these! They are delicious for starters. And they leave a lasting- GOURMET- impression on all your desserts. I finish a death by Chocolate or Mocha Latte off with one of these little gems! These coffee beans are addicting! We used them at an event recently combined with the other flavors and almost all of them got eaten up. These espresso beans taste amazing. They taste like the best mocha you've ever had. Some people can't enjoy such a strong coffee flavor but I think it tastes wonderful. These are white chocolate covered espresso beans. They are really pretty.. we mix them in with the regular chocolate ones to make really pretty presentation. Love the chocolate covered espresso beans. Love the marble ones even more. It is the perfect blend of chocolate and whit chocolate. Totally amazing. Try some today. These are a great alternative for customers who prefer white chocolate or light coffee flavor over dark or milk chocolate. We love having the extra option that many shops simply just do not carry, plus these look beautiful when displayed!